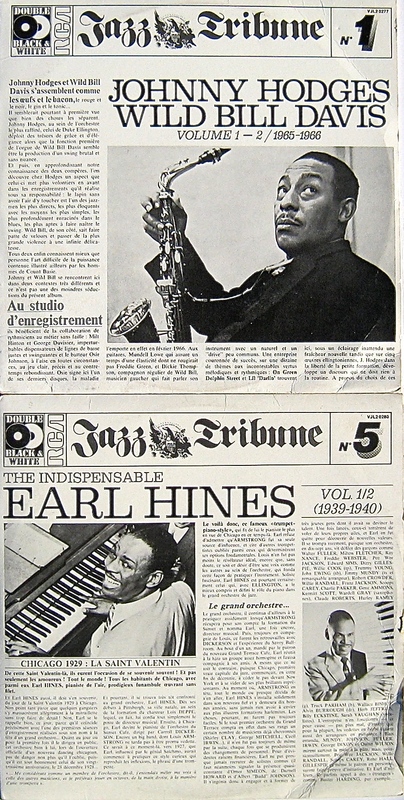 The Jazz Tribune series was released by RCA records in 1979-80. Comprising more than 75 titles, each one a double album, they were a scattergun history of jazz. Liner notes were patchy, which did not endear them to jazz fans. The notes were also repeated in French (or in English, depending on your language perspective), which did not endear them to those lacking facility in the language of lurve. Yet chosen with care, they provided an inexpensive gateway to jazz history. How many out of 75 do you own? Just these two, purchased for the newspaper covers (of course). There are better pathways to the Joys of Jazz! You big let down! I was banking on 75/75 – call yourself a collector?! I guess so… but a discerning one (I hope) (sometimes). I remember seeing some of the Jazz Tribune series when released … something to keep the eye open for in the Op-shops of Melbourne’s Far south East. Yes, I think they are op-shop material really. Interesting but inessential. CD has been a rich and often good value medium for jazz re-issues; theses are titles that don’t really merit re-release. Yeah, I had to edit my first response on that one. Anyways it sounds good. Was listening to Jimmie Smith last night. Jimmy Smith is the Man for B3. Lovely.